Ann Taylor (1782 - 1866), later Mrs. Joseph Gilbert, was an English poet and children’s author. She is best known as the sister and collaborator of Jane Taylor. Jane Taylor (1783 - 1824), was an English poet and novelist. She wrote the words for the song “Twinkle, Twinkle, Little Star” in 1806 at age 23. The Taylor sisters were part of an extensive literary family. In this poem, Meddlesome Matilda learns her lesson after an unfortunate encounter with a snuff box. A poem/nursery rhyme about the rewards of good behavior. A poem about a violet and its beauty. A nursery rhyme that imitates a lullaby about the evening star. FCIT. "Ann and Jane Taylor author page." Lit2Go ETC. Web. 23 April 2019. 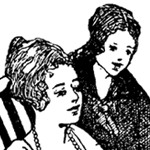 <https://etc.usf.edu/lit2go/authors/110/ann-and-jane-taylor/>. FCIT, "Ann and Jane Taylor author page." Accessed April 23, 2019. https://etc.usf.edu/lit2go/authors/110/ann-and-jane-taylor/.